Playing to 345 yards from the men’s tee, the opening hole offers a generous fairway for the tee shot. The approach shot plays longer than the indicated yardage up a short, steep hill. Enjoy the view of the harbor, with Schoodic Head in the distance. The second hole requires a well placed tee shot to a blind landing area. A creek bisects the fairway approximately 220 yards out. A 252 yard drive will carry the creek and leave a short wedge to the green. Most players will lay up short of the creek with a 200 yard tee shot leaving a longer approach into the prevailing wind coming off Frenchman Bay. Pause for a moment to enjoy the breathtaking view of Ironbound Island with Mt. Desert Island and Cadillac Mountain in the distance. Next up is a 317 yard dogleg left. A 200 yard shot up the hill leaves a short approach down the other side. As you reach the top of the hill a spectacular view of Frenchman Bay awaits. The tee shot here, while only 138 yards, is trickier than it appears from the tee. Trouble lurks to the left, toward which the prevailing wind will try to bend the ball. Once on the green the adventure continues. Woe to the golfer whose ball is above the hole, as a put from there may run off the green. Par is a welcome score. Those who do do not make par can take consolation in the view of Frenchman Bay. At 413 yards from the men’s tee this is the longest par 4 on the course. It is essential to find the fairway off the tee, as it is difficult to reach the small green from the deep rough. Left of the green lies thick forest, and golfers who play a conservative shot to the right of the green face a challenging chip which will run quickly down the hill and often off the green. Par is a welcome score. 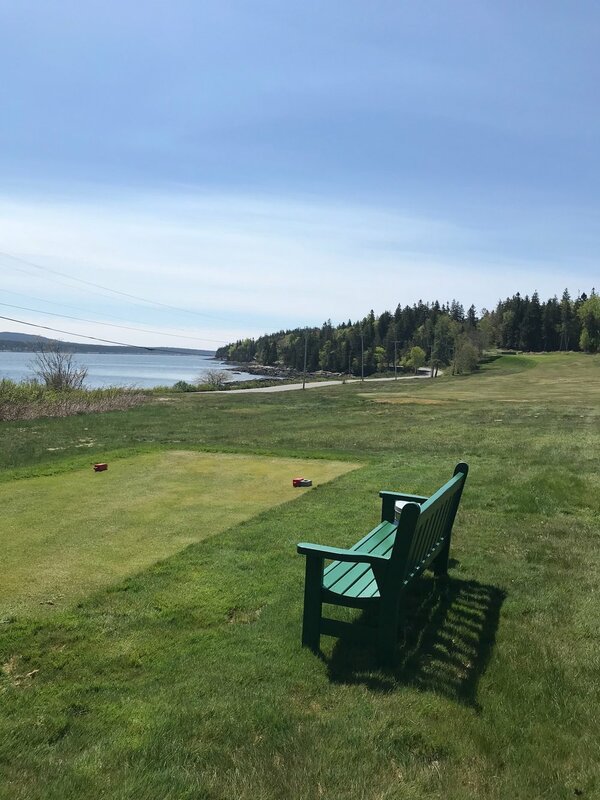 Enjoy the view of the harbor as you leave the green and make the short walk to the next tee. It is best to keep the tee shot to the right side of the fairway of this 345 yard par 4 for the most favorable angle. The approach shot to the elevated green plays considerably longer than the indicated yardage. A ball which lands on the false front will roll back down the hill - as will a shot which misses left. Good scores can be had, but double-bogies are not rare. The walk up the fairway offers a terrific view up the harbor to the Mark Island Light and the open ocean beyond. Another blind tee shot into a fairway which slopes right to left. As the hole plays 457 yards, longer hitters will have an opportunity to go for the small, elevated green in two. The rough will challenge those who do not find the fairway. Enjoy the views through the trees of the many recreational boats moored in the yacht harbor. Playing to 343 yards, this is one of the more straightforward holes on the course. Find the fairway off the tee and be rewarded with a chance at birdie. The green falls off to the right, and the forest is close by on the left and behind the green, so a good miss is short. Look back across #7 fairway for an elevated view of the boats in the harbor. The challenging finishing hole plays to 407 yards. Thread the drive between trees left and right of the tee box down the hill to the generous fairway. The approach to the green requires and accurate shot, as trees line the left side of the fairway and the rough to the right of the green makes for a difficult chip. As with most holes at Grindstone Neck, the best miss is short of the green. Enjoy the view toward Henry Cove on the right of the fairway.